This article is equal to shameless self-promotion. We recently launched our mobile version of AlohaRents.com. Basically, this gives nomadic travelers instant access to Thrifty, Dollar, Enterprise, Budget and our other partners rental car services in Hawaii. You may never need a laptop again with the breadth of services available on the internet. The image pictured on the right is a screen-shot of the mobile website on an iPhone. 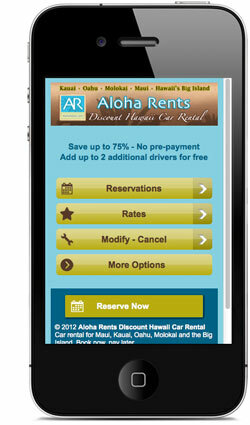 Please send any suggestions or reviews of the mobile site to us here at Aloha Rents. We may take advantage of your ideas regarding improvements to the rental car hire process. Peruse our article about smart phone apps for our Hawaii rental customers.